Citizens of Dalaran! Raise your eyes to the skies and observe! 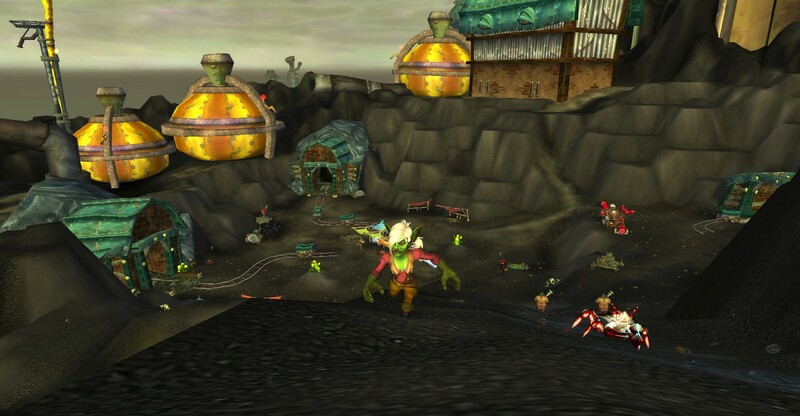 For the very last time in Warlords of Draenor, our world’s destruction has been averted in defiance of our very makers! 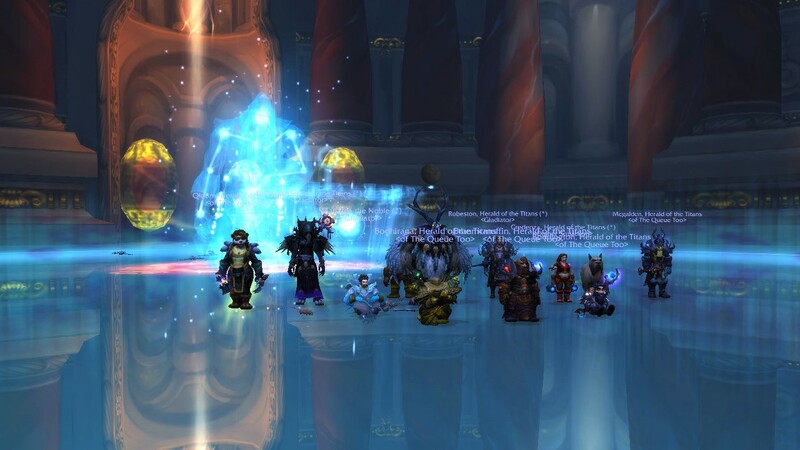 Algalon the Observer, herald of the titans, has been defeated by our brave comrades in the depths of the titan city of Ulduar for the eighth and final time. Cold logic deemed eight runs too many. Cold logic, however, does not account for the power of guild dedication!. It’s up to each of us to prove this is a Feat of Strength worth obtaining! That our titles… our titles are worth earning. Man, I couldn’t say goodbye to my Herald of the Titans runs without quoting dear ol’ Rhonin. Don’t worry though, unlike Rhonin, I can keep the speech down to once through. 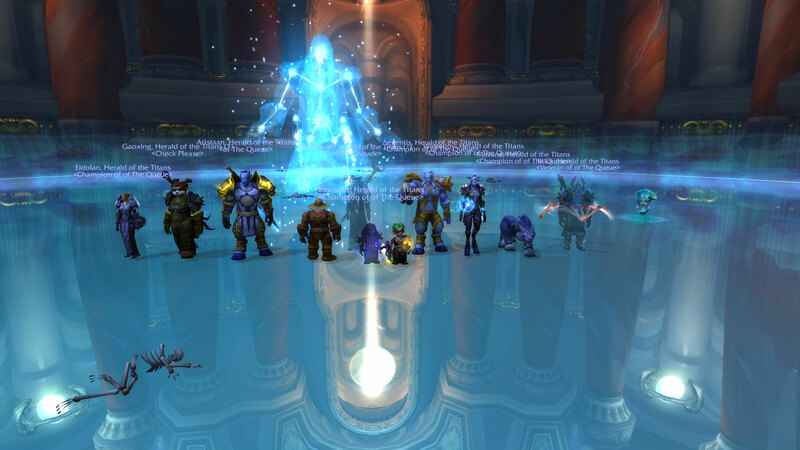 With the final group defeating Algalon on Wednesday, <oTQ> has officially ended our Herald of the Titans runs for this season. And because of the upcoming changes to set bonuses in older expansions, the Wednesday run may have been our last run… forever. Herald of the Titans has been my pet project for almost two years now. I’ve leveled up three different characters, cleared Naxxramus for gear more times than I care to count, and helped get over 50 people their Herald of the Titans title. It’s been a long, sometimes frustrating, but overall, incredibly rewarding journey. And I have to admit, a part of me will always love the Algalon encounter. Except the Cosmic Smash. Screw the Cosmic Smash. But every other part has a special place in my heart. Herald of the Titans was really my first experience organizing and executing a large scale group activity. At first it was just guildies but in time, it grew to include other friends, acquaintances, and eventually random people who’d heard of the runs. I quickly found the best ways to get key details out to people (bold, change the color, and jack up that font size) as well as the importance of keeping my master posts up to date. I also learned how to deal with failure. Our first couple of runs actually ended in wipes for 3 hours, something that I had definitely not expected or planned for going in. There are ways to keep morale up and ways to encourage improvement and those first couple of runs were an awesome teaching experience. And finally, I got to meet and interact with all sorts of people. Good friends who I got closer to. Guildies who I didn’t know as well before the runs and became friends with after. People who joined our guild because of Heralds. Twitter folks who I’d never gotten to play in game with before. And all the random folks who stumbled across the page after googling ‘Herald of the Titans runs’ (we were one of the top hits!). It’s been a fantastic two years. However, like all things, this chapter is coming to a close. To all of those helped supply the runs, to those who kept coming on the runs to help me fill the occasional open space, and to those who got their titles through the runs, thank you. Thank you for coming along for the ride, for gearing up your characters, for maxing out those gems and enchants, and for watching out for the Cosmic Smashes. And congratulations, Herald of the Titans! If you had told me a year ago that I would be raiding current tier progression, I would have looked at you and laughed. If you had told me a year ago that I would be the officer in a guild 900 strong I would have shook my head and told you no way. If you had told me that I would have tanked current raids, led three groups successfully to their Herald of the Titans achievement, or fallen in love with the monk class I simply would not have believed you. And yet here we are, a year later. And all those things are true. A year ago, I was a part of a small but cheery little guild. While it was full of wonderful people that I truly enjoyed playing with, it just was not a good fit for the way I played the game. A year ago I was an average pug healer. Occasionally I would have some really good plays but I wasn’t much special. I wanted to raid more than the pugs I could get into, but I didn’t think there was a guild out there who would want me with my unpredictable schedule. A year ago I was terrified of tanking. I couldn’t even lead a dungeon at max level, let alone tank any raids. A year ago, I restricted myself to what I had at that time. I rarely went far beyond my comfort zones and I hesitated before most opportunities. What was that thing Garrosh said in the cinematic? Today I am a proud officer in <Of The Queue>. I have successfully lead a number of events. I have tanked all of Highmaul, most of Blackrock Foundry, and a bit of Hellfire Citadel. I have become a much better healer, capable of using my cooldowns and abilities in a raid environment. I am in a raid group that is 7/13 in Hellfire Citadel and progressing rapidly. And I now rock a mistweaver and brewmaster monk as my second main. So many times we stop short with what we have. We are so afraid of change and of failure that we don’t move forward. What we have is good enough, no need to desire more. But the world out there is boundless in it’s opportunities. Even if we fall, we can always get back up again. Have I had my fair share of failed ventures? Absolutely. I worked so very hard on things that completely fall through. I’ve said “Good enough” instead of finding ‘best’. I’ve let fear keep me from trying new things. But I’m making the conscious effort to stop. I want to experience all that the world has to offer (both in game and out). Instead of saying no, I want to say yes to new experiences. Because the world moves and world changes. Times change. I have found my niche in the game where I am happy. I log in and say hello to all the people and I feel like I belong. I’ve pushed beyond my ‘good enough’ and into my ‘great’. I’ve found friends to support me and taken opportunities that I never would have dreamed of getting. And most of all, I’ve accepted that it can change. Everything can change. I won’t be stuck in the past, grasping at the almosts. So this is my message to you today. A bit sappy, I willingly admit. But genuine. Seek out what makes you happiest. Times change; let yourself change with them. Find your ‘great’. Completing something and earning a reward always carries a strong sense of satisfaction. But when you complete something, and it was hard, and it took time, and it took effort, that satisfaction is greatly increased. There’s this pride that just doesn’t come when you are simply handed a reward. A fist pumping, ‘yeah I did this even though it was hard!’ pride that makes the whole experience seem so much more worth it. It might have been difficult, but it doesn’t matter in the end. You did it. I have been lucky to experience this a few times in my video gaming career. One huge time was when I finally, after months of trying, got my Ahead of the Curve Garrosh Hellscream kill. I’d spent so much time and effort working towards it, that once I finally got that achievement, I felt on top of the world. And just last weekend, I had another such experience. It all started with a little wish for the Herald of the Titans title. In the early days of ‘Of The Queue’, several people (including myself) had expressed a desire to work for that title. Being an events coordinating officer, I did some research and set up a group. That group quickly expanded to three groups, and we began cheerfully leveling and gearing up. For about a month and a half, we made preparations for the real runs. We ran leveling dungeons, and then once we were at level, we ran gearing raids. Morals were high and we expected to gear up and get Algalon down easily. After all, all of the resources we had found has stressed how easy the encounter had become. Heck, two prot pallies had duoed the encounter at the end of Mists. Unfortunately, the encounter was not as easy as we had been lead to believe. Not in the slightest. We got to the first of the runs and commenced our first pulls on Algalon. And that cursed messenger absolutely wiped the floor with our faces. Our tanks couldn’t last more than twenty seconds even with our healers popping all their cooldowns. I think the lowest we were able to get him that first night of attempts was 45% down, by bursting as much as we could in the first minute before we’d be crushed. We simply couldn’t handle the amount of damage he was putting out. After a good 2 and a half hours, we called it quits for the night. 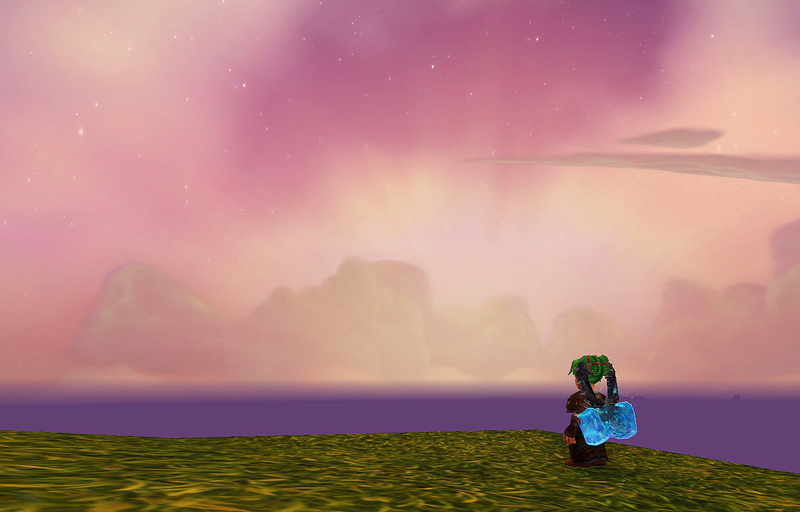 As I have previously written about, this was the point where I took up Brewmaster tanking. The next night I very rapidly learned how to tank and we started our first pulls. We were better. We were definitely better. We could hold together for longer, had a coordinated plan, and were able to better execute the mechanics. The percentages on wipes slowly creeped down. 45%. Then 35%. Then 25%. We worked just as hard if we had been raiding current cutting edge raids, doing the dance of dps, healing, and tanking. But it just wasn’t enough. Wipes got down to 19% but we just hit a wall. Algalon was hitting like a cement truck and there was no way around it. I would pop Guard, an ability that puts a pretty sizable shield on me, and Algalon would tear through it in one normal melee. Every special ability hit required some sort of cooldown and any tank mistake would end up in death. If the heals missed even a single cast, someone would go down. The margin for error was tiny and as we got more tired, we just couldn’t tighten enough to get him down. Again we called it for the night. However, instead of picking up a new spec I went and did some extensive research. At first I had been worried that our failure had been some fault of our own, but what I found out disproved that completely. It seems that Algalon had become much harder post squish. In fact, he was as hard if not harder than he was when the fight was current. Apparently Algalon’s damage has not been properly reduced, so moderate melees became crushing blows. 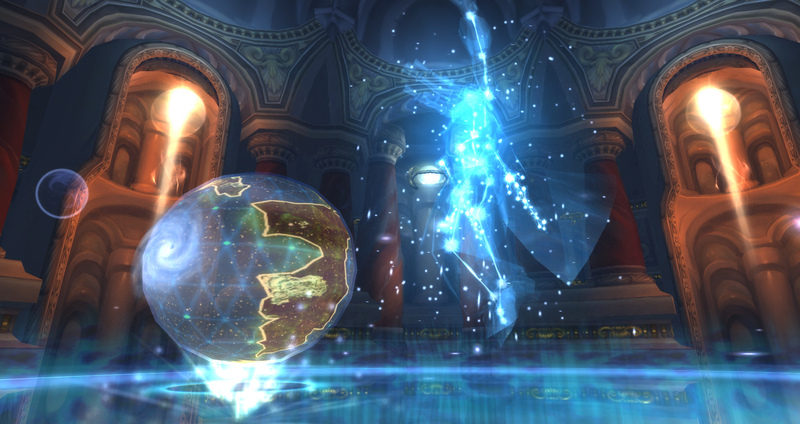 As one poster reported, Algalon is capable of putting out 44k damage in a matter of seconds. To give you some perspective, my fellow tank and I have about 50k health maximum. A few moments of healing lapse and the tanks would go smush. I also learned the vital importance of flasks and potions (we had figured this out in our owns raids, but further reading cemented the fact). Every toon in the raid has to been maxed out to the nines, or we wouldn’t be able to overcome the encounter. Armed with new knowledge, we attempted for a third time. We got all ready to run but one member of our group had to drop because the encounter wasn’t letting her zone in. We attempted to find a 10th member. In desperation, I put up a group in the Group Finder. We got a bunch of 100s, and then a whisper from one dude. One awesome dude. Duskraven-Lothar just happened to be skimming when he found our group. He got on his semi-geared shadow priest and we were all ready to roll. Right away, there was a difference. The fight was just as hard as ever and many wipes were still had. But we were executing mechanics better than ever before. A solution was found for a difficult mechanic that had been the causer of many wipes. Duskraven-Lothar dependably cast Dispersion and soaked the mechanic for us (seriously, this guy was awesome). We started at higher percentage wipes but slowly but surely got down to less than 20% ones. We were almost there, wiping a few percentages away from kill in the second phase. But we had stalled, we just needed that final push. One of our members announced that she would have to leave in ten minutes, and that was the motivation that did it. Several more wipes and were were just about there. And then the star aligned. It was the last attempt for the day. After weeks of practicing, we executed the fight perfectly. Adds were going down properly, damage was being avoided if it could be. We got all the way into the second and final phase with no one dead. For a few tense moments, we gave it our all. Heals, dps, tanking, all frantically done in an intense silence. Then, Algalon despawned. We stood, shocked, for a moment or two. Across everyone’s screens flashed an achievement months in the making. Herald of the Titans. We had done it. We had done it! I want to thank my team for their continued efforts at this. Every time we ran, our members brought some new tips, tricks, or experiences to the table. For a team that had never raided before together, we tightened remarkably well. You guys were the reason we were able to get this, and I couldn’t have asked for a better group. Congrats and thank you! This was probably one of the proudest moments of my WoW career. Just thinking of it brings a smile to my face. My team and I completed something insanely hard together despite the odds being stacked against us. It was a powerful learning experience with a worthwhile reward and I’m so glad that we decided to embark on this quest. And I’m never going to take that title off now.